Identify and recognize the trends behind the growth and evolution of stadium and arena design as places of public assembly. Assess the health and safety performance aspects of walkways, stairs, and escalators as part of an overall pedestrian circulation system. Explain the importance of proper attention to details for the performance of critical design components such as movable glass walls, heavy duty flooring and others. Determine ways to apply the principles as presented into building projects demonstrated through case studies. America and the world seem to love stadiums and arenas. Whether it is due to loyalty to an alma mater or feeling part of a community championed by a professional sports team, these unique building types draw people, and lots of them. They also seek to be used for a wider variety of events than just sports, including entertainment, education, and special gatherings. Over the years, newly designed facilities have become larger and more sophisticated than in the past. No longer limited to outdoor seating areas using bleachers, users and owners demand more amenities and features that offer comfort and choices. The attending experience has become more important than the event or game itself as the ticket holders expect more from their surroundings—a level of experience more akin to deluxe hotels, clubs, and restaurants. Architects and other design professionals involved in projects for new or renovated stadiums and arenas are responding to these needs with well-designed and creatively executed spaces. But truly successful designs also need to respond to the practical needs of high performance required by the intense activity of large crowds on a regular basis. Part of the reason behind the growth in stadiums and arenas is certainly linked to the growing populations in urban areas where most of these facilities are located. A recently released report indicates that urbanization will see a 2.8 billion increase in city populations by the year 2050. Cities across the country are already seeing some of that growth and have been able to build stadiums in recent years in the downtown areas of cities such as Indianapolis, Dallas and New York. Plus stadiums and arenas are becoming supported with nearby mixed-use projects and expanded entertainment properties. This means that they are moving beyond the typical open seating areas and public spaces. Rather, they are becoming part of a vibrant, urban neighborhood that provides people with a unique social experience with options to suit their tastes and preferences. In essence, the spaces in and around the stadium or arena have become as competitive for attracting people as the events that it focuses on. Stadiums and arenas, such as the Autzen Stadium at the University of Oregon shown here, are becoming larger, more sophisticated, and more attuned to the current demands of people who experience these facilities. Part of the experience at events is interacting with others. But there is a difference between interacting with the whole crowd in an outdoor venue and joining with a specific group in a separated area such as a suite, box, or other enclosed area. 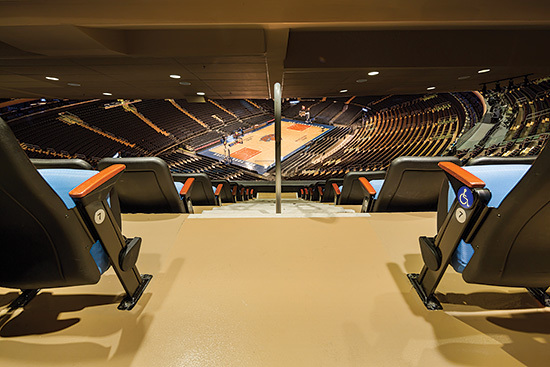 The ability to carve out such spaces and to make them flexible is certainly a growing trend at stadiums and arenas. The experience becomes more focused socially on being part of a select group rather than part of a large throng. These separated areas may include enhanced or catered food and drink, more comfortable amenities, and glazing that separates the space from the main open area. In many of these situations, particularly in outdoor stadiums, there is also a growing trend to provide flexibility in the enclosure such that the glass is in place when needed for weather or comfort control, but able to be opened or removed in favorable conditions. Efficient circulation routes and mobility of people is important in any building but in a high-density space like an arena or stadium, it is critical to keep the flow of people moving. It is also necessary to prevent congestion which could become unsafe in emergency situations or where it induces panic and harm. Accordingly, both horizontal and vertical pedestrian circulation has been receiving more attention in these venues. The accommodation of people of all ages and all levels of ambulatory abilities or disabilities requires both good master planning and attention to detail. It also requires an awareness of the various options available for both static and moving pedestrian routes such as stairs, corridors, escalators, elevators, and moving walks. Directly related to the accommodation and movement of people, the choice of materials used for flooring, stairs, and other surfaces has evolved for these large assembly spaces. A variety of durable, colorful floor surfaces has emerged that can not only withstand the rigors of high traffic areas, but they can also incorporate custom colors and designs. This plays directly into the spirit of such places where logos, mascot images, and other elements of pride can become part of the building and the experience of attending. The experiences of people in the seats within the larger facility, such as Madison Square Garden in New York, are driving the trends and evolution of stadiums and arenas of all types. Create flexible suites that offer a unique experience by allowing the occupant to open or close the NanaWall panels with ease. When open, the fan experiences the crowd but when closed, the NanaWall provides a transparent barrier with unobstructed viewing while providing protection from wind, cold air and noise. Our durable, seamless floors are stain, slip and impact resistant, easy to clean and they honor great design. Manufactured & installed in front and back of house spaces; entrances, seating areas, concessions, restaurants, ramps, suites, locker rooms and rest rooms. Custom colors, logos, wide choice of finishes and textures too. Take our Escalator 101 course and earn one AIA Learning Credit. ThyssenKrupp Elevator understands you are expecting a crowd, so call us for the escalators you need and the experts who can help choose the right equipment, handle the installation and perform service you can count on. Anti-Slip Safety Stair & Walkway products for new construction and renovation. Brand names include Supergrit, Spectra, Alumogrit, Stairmaster and NITEGLOW. Product application includes commercial and residential buildings, transit systems, stadiums and ballparks. For indoor and outdoor use. ADA , New York MEA, IBC and IFC complaint. Available in a variety of profiles and colors.